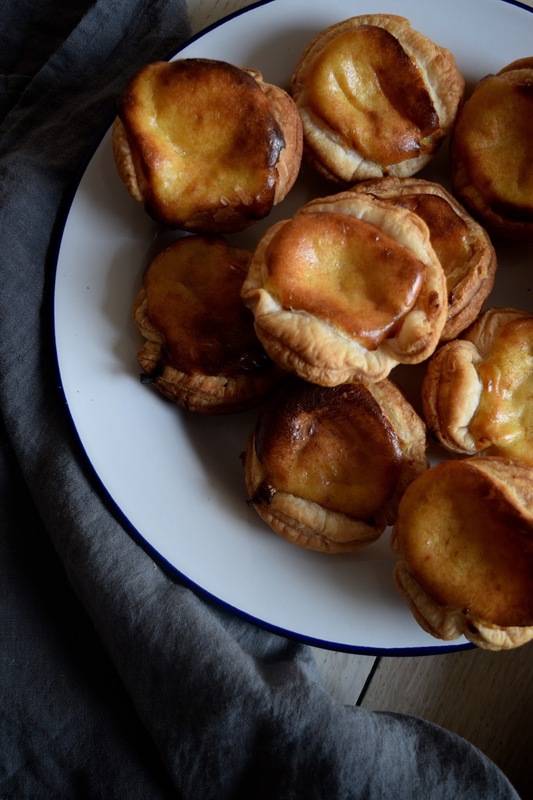 These custard tarts are delicious. 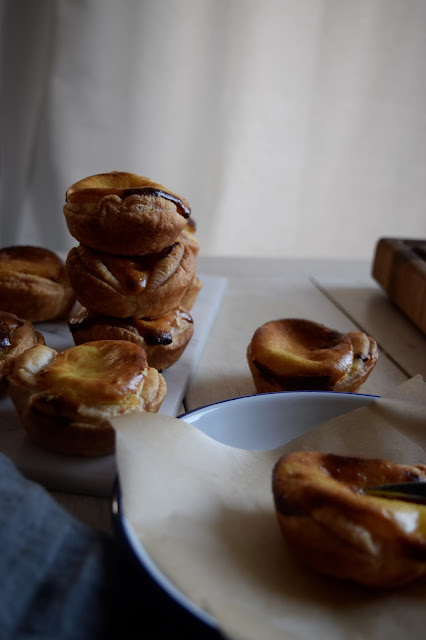 They are as easy to make as they are tasty and you can serve them up with a piping hot cup of tea for a treat at elevenses or they are perfect for a mid week pudding, served warm with a dollop of greek yogurt and a little hot custard over the top. Custard was never one of my most favourite things, in-fact I would go to extreme lengths to avoid it at school lunches and would always pass it on when offered at a dinner party. 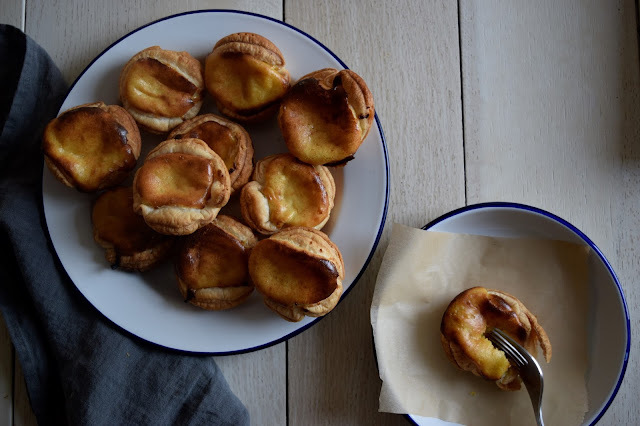 My love affair with these sticky pastries all started at university, when one of my housemates would meticulously plan her Sunday mornings around a cup of tea and a hot custard pastry from the local shop. I soon joined in and these pastries became somewhat of a weekend ritual. The past few months these little Portuguese style tarts seem to be everywhere. So many cafes I pop into are serving up these tarts and even tiny market towns near home have them piled high. These are without doubt the pastry of the moment and thanks to my new found love affair with custard I am a big fan. Mine do not look quite as picturesque as they might, but the more rustic looking I find the tastier the bake! I used Donna Hay's recipe found in her new book The New Classics. Start by preheating your oven to 200C and set about making your lemon flavoured syrup. Place your water, lemon peel and vanilla pods (cut open) into a saucepan on a medium heat and let the sugar dissolve. Once dissolved then allow to boil until thickened, about 3 minutes. Now mix your cornflour and milk in a large bowl until smooth, add in the 3 yolks and whisk until well combined. Pour this mixture into a saucepan and bring to boil whisking continuously until the mixture has thickened and set to one side to cool. Now roll out your puff pastry and cut out circles, roll out each circle to made each slightly bigger and thinner. place into a non stick tart tin and spoon the custard mixture into the cases until smooth and covering your pastry. Bake for 25-30 minute or until golden. Serve still warm from the oven with piping hot coffee on a Saturday. Let me know how you get on!